It is not a situation anyone wants to be in: lost in the woods. Should the unthinkable happen, however, there are people and animals ready and willing to head into the wilderness with a compass and GPS to find you. Kelsey Deer is one of those people, as she continues to hone her skills as a certified search and rescue agent. 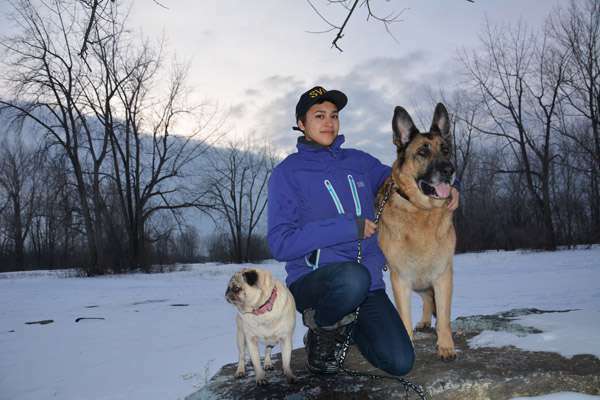 She started training to be a search and rescue agent last March, and became certified in September with the Quebec Association of Search and Rescue Volunteers (AQBRS), the organization the ministry of public security or the Surete du Quebec contacts when needed. No one is permitted on a search and rescue call unless they are certified by the AQBRS. Assistant Peacekeeper chief Jody Diabo said that if a rescue were needed in a place like Tioweró:ton, the PKs would contact the SQ, who would contact search and rescue teams that could include Deer. Deer has been on red alert calls, but not on any real-life situations. Part of the issue is time. There are no regular nine to five office hours for search and rescue workers. Two skills make up a large chunk of search and rescue skills. Neumann said he looks for rescue workers that are energetic, enthusiastic and reasonably fit. Deer checks each box. “Kelsey is just a perfect candidate for a search team because she wants to do it, and she finds it exciting,” said Neumann. At times, Neumann has candidates that have a casual attitude towards the job that causes him to pause. “As soon as I hear ‘that is neat,’ I put a red flag up,” he added. Deer’s partner in training is her six-year-old German Shepherd Rick, who has been learning primarily tracking skills for the past year. To be a certified search and rescue dog, Rick would need to pass a test that involves a two-kilometre track that Deer said he is not ready for. Though Rick may not become a search and rescue dog due to his age, Neumann said Deer’s work training the dog is an asset. “She’s working hard with her dog, which is a bit older, but it’s a good starter dog to do tracking,” said Neumann. Rick has not done much “air scenting,” as Deer wants to stick with tracking where Rick keeps his nose to the ground and follows a trail to the lost victim. Ideally, training involves having the search and rescue agent, a backup person and someone to lay on the ground for the dog to track. Deer’s small team is not always able to accommodate the training, and, aside from her boyfriend, Deer does not have many people who are willing to walk a half-kilometre or so in the snow and wait for Rick to find them. “We’re at a point now where I just can’t get anyone to help me because I’m doing longer tracks now,” she said. Rick is older than most trainees, but Deer is still intent on pushing him as far as he can go. After participating in a simulated plane crash in October, Deer got the urge to be in a real-life rescue situation. At the beginning of March, Deer and her team will participate in a simulation exercise dealing with the after-effects of an earthquake. Neumann has complete confidence in Deer’s ability to work in the field, and knows if the call came in, she would be ready.